I absolutely love giving gifts. Shopping for them, wrapping them, getting cards to accompany them (I have a weird obsession with stationery for a 21 year old), and especially watching people open them. Plus, I always get a little ego boost when my gift is the most adorably wrapped in the pile. So, here are some ideas for the next few presents you’ll give, cuteness factor courtesy of washi tape. Simple and classic, this idea can be personalized in any way you see fit. Start by wrapping the present, just to get that bit out of the way. 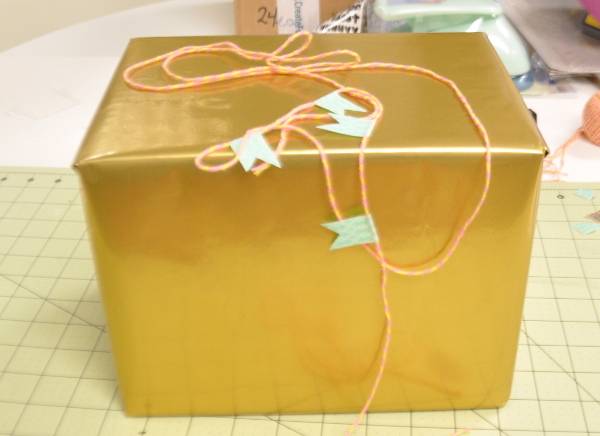 Then measure the bakers twine or embroidery floss around the box however you want it to appear (just don’t tie it yet!) so that you can get the proper length. 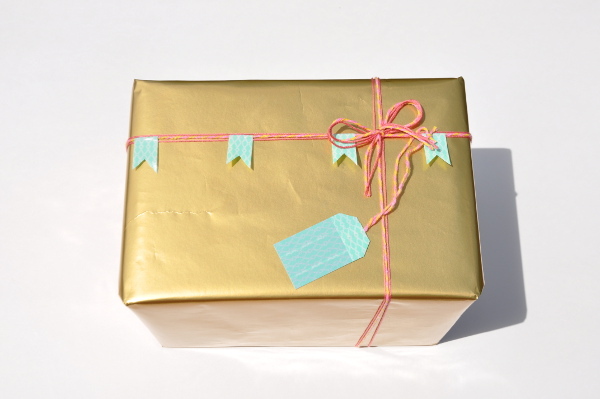 With the twine or floss still on the box, attach pieces of washi tape near the edges so that you can see how far apart they can be, and where they should be for when you re-tie it around your gift. For this particular design I placed a piece of tape on the left and right side of the twine, right next to the edge. That way when I removed the string from the box I was able to place two more pieces in the middle. 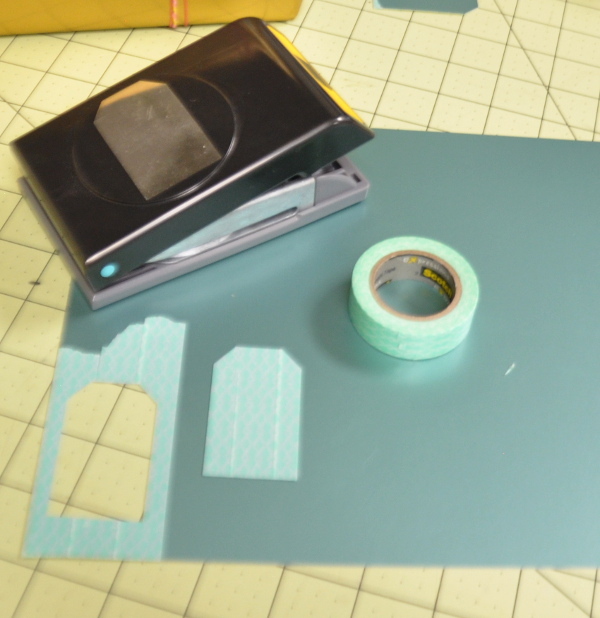 The next step is to cut the washi tape with a craft knife in little banners or triangles to make them look like mini pennants. I used a cutting board that had 1 inch lines on it and I used that as a guide while I was cutting out my shapes. 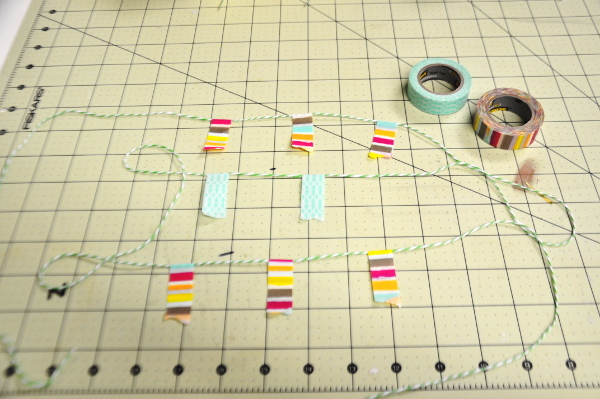 Each little banner and triangle is an inch long and as symmetrical as I could make it! 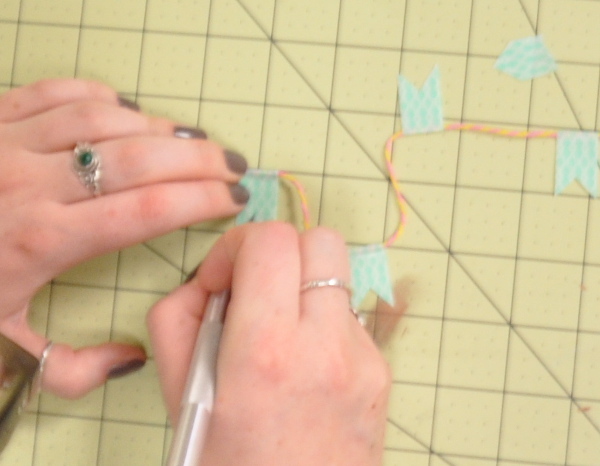 Once your shapes are cut out, it’s time to wrap the twine or thread (or both!) back around the gift box. 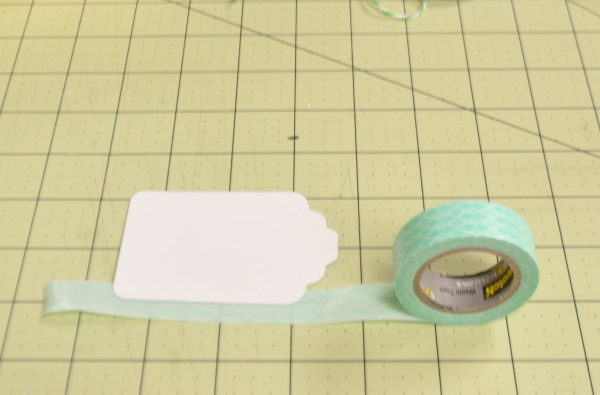 One of the best things about washi tape is that if it ends up a little bit off once you re-wrap it, it can be slid along the twine or thread super easily for minor adjustments. 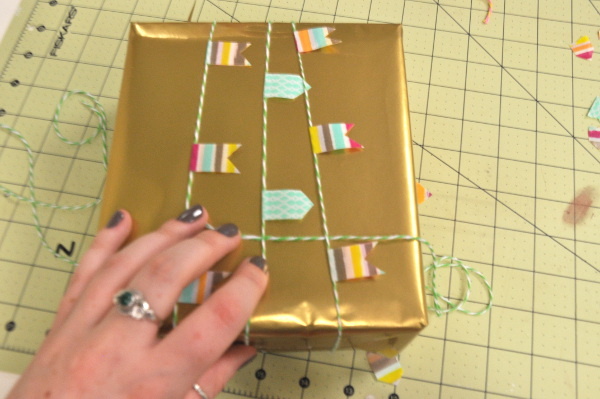 For this design, once I wrapped the bakers twine with the washi tape around the box and tied it, I wrapped two pieces of embroidery thread on either side of the twine and tied it all together in a bow. 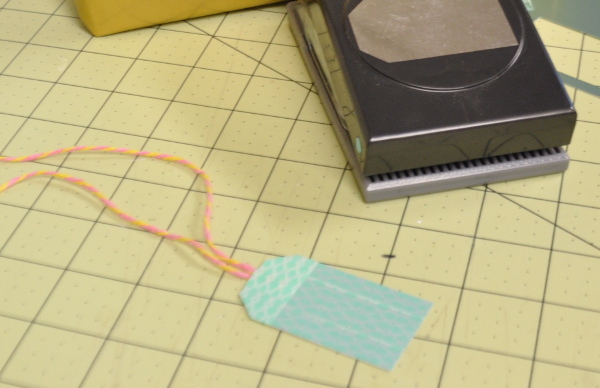 To keep the patterns consistent, I decided to cover the cardstock I had in the same washi tape I used for the pennant to make the gift tag, then used the same bakers twine to tie it on. Warning! This took me much longer than I expected it to. By the time I’d realized what I had taken on it was too late and there was no turning back. But just look at how cute it turned out! I started this design by wrapping the gift, and then the embroidery floss around the box, just as I did with the first one, so I could get the proper length. Again, like the first design, I placed the washi tape on the left and right edges, as well as the top and bottom edges so I knew the outside boundaries of my mini pennants. With the floss still wrapped around the box, I placed a total of 5 pieces of washi tape on the horizontal (shorter) part of the floss (H-A-P-P-Y) and a total of 7 on the vertical (longer) part of the floss (B-I-R-T-H-D-Y, the A is in “happy”). From there I removed the string and cut the washi tape pieces into little triangles, again using the 1 inch lines on my cutting mat for guidance. 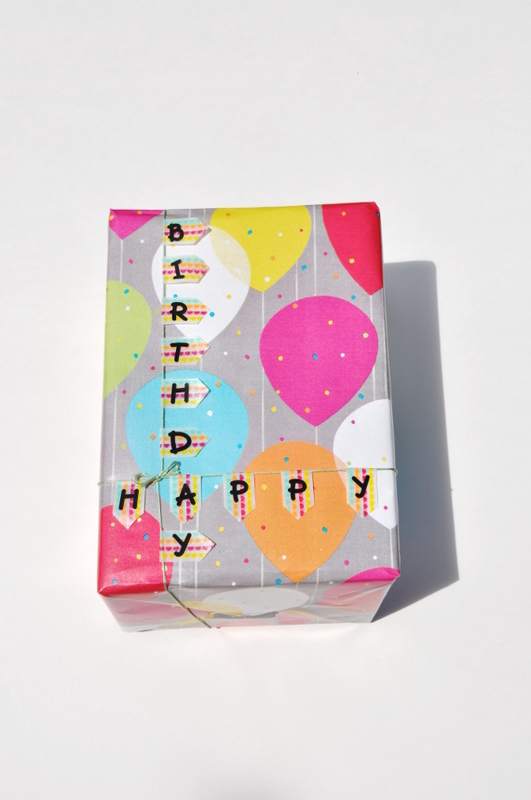 I used stickers to write my “Happy Birthday”, but you can certainly show off your own penmanship by writing it yourself in permanent marker. 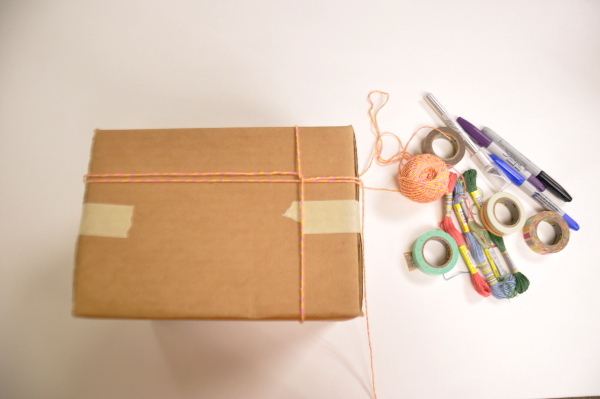 To finish up, re-wrap the floss around your box and adjust the washi tape as needed. 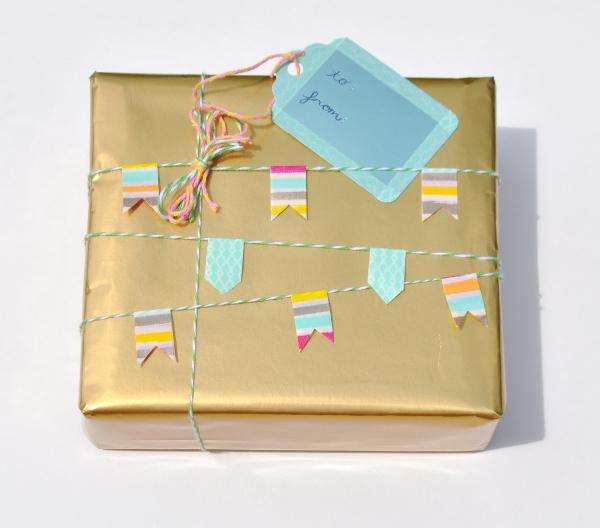 Make the most of pennants and bakers twine with this cute wrapping! But maybe have the scissors handy when it’s time to open gifts. 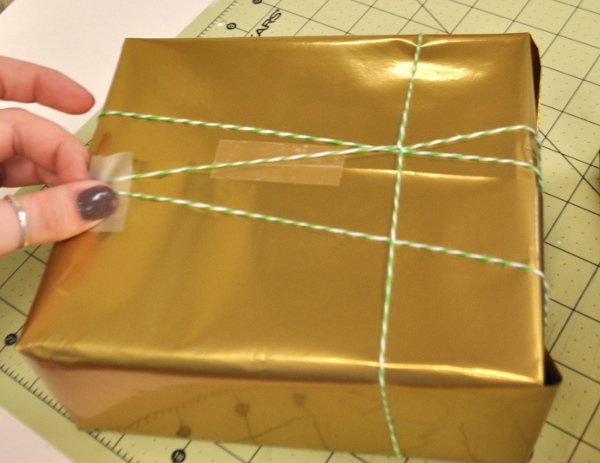 I’m sure you get the picture by now, but wrap your gift first, then your twine. I measured out the amount of twine I would need by wrapping it around the box 3 times, then twisting it underneath to bring it back to the top for the bow. I then measured out where I wanted my little triangles and banners to be on the mini pennant, removed the string from the box and cut the washi tape with my craft knife. 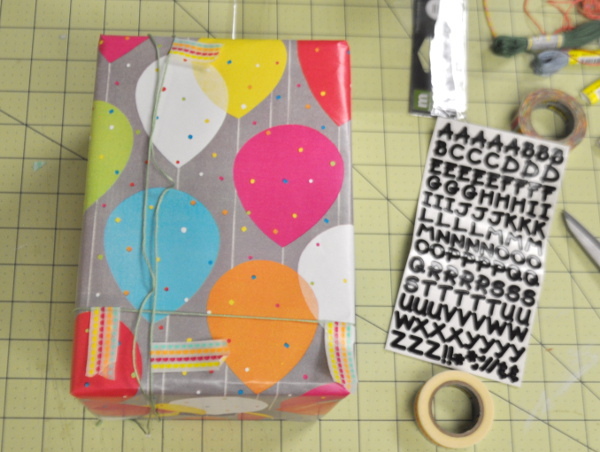 Once I had the shapes cut out of the washi tape I re-wrapped the string around the box and tied it. I also taped the string underneath so that it would stay diagonal on the top of the gift. To keep everything in place, when I wrapped the string back around to the top to make the bow I tucked it underneath the strings with the washi tape pennants. To make the tag, I used a paper punch to cut out the cardstock, then lined it with the same washi tape I used on the pennants to keep the patterns somewhat consistent. I punched a hole out of the top and tied it on with one of the same colored strings I used in the bow. And there you have it! A couple of tutorials on one of my favorite things to do. Replicate them, or simply use them as a guide to get your own creative juices flowing! 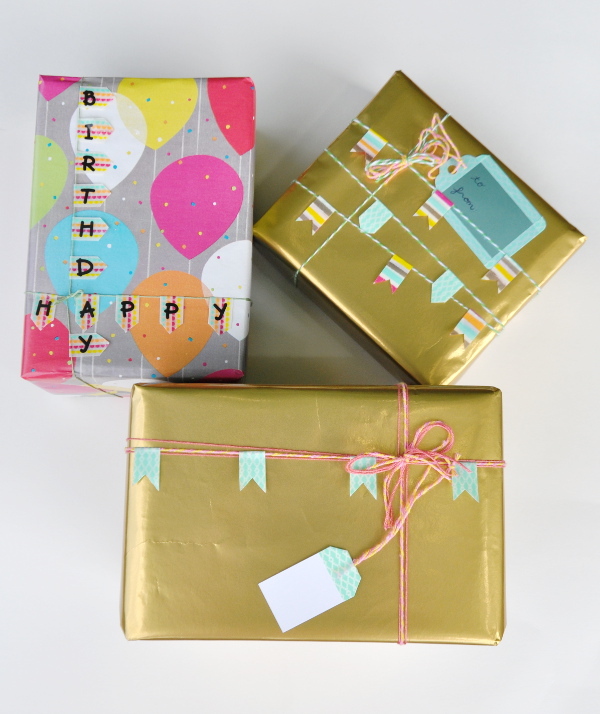 This entry was posted in Birthdays, Crafts, DIY gift ideas, Holidays & Seasons, Paper Crafts, Parties and tagged Baker's Twine, Gift Wrapping, Washi Tape on June 29, 2016 by Morgan. Hi there! I'm Morgan, the summer intern at Create For Less. I've tried my hand at scrapbooking, sewing, and knitting. After a bit of trial and error, I've finally decided that up-cycling and repurposing is my favorite type of crafting. When I'm not at the office or my other job at a tavern, I like to travel, take photos, and hang in the great outdoors.